Sums to 3. 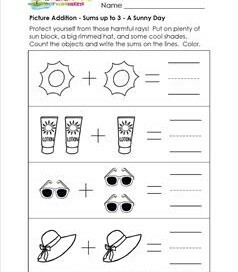 Here’s a few things to remember for a day in the sun: suntan lotion, sunglasses, and a sun hat for protection. 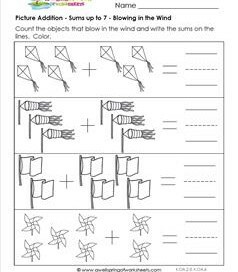 Add these items and write the sums on the lines. Sums to 3. You can never get enough of the pure nutrition that comes from whole foods, that includes fruits that grow on trees – apples, peaches, oranges, and pears. Add them up and write how many. Sums to 5. 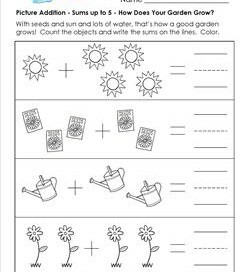 Follow the steps in this worksheet to grow a garden. When you have sunlight, plant the seeds, water them and viola!…flowers. Count the suns, seed packets, watering cans and flowers. Sums to 5. 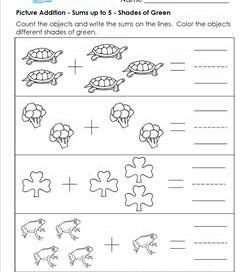 Now here’s a novelty – an addition worksheet with green things – turtles, broccoli, clover, and frogs. Add the objects and write the sums on the lines. Color different colors of green. Sums to 7. 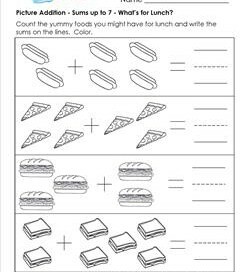 This page is sure to get you thinking about what you’re gonna have for lunch. Are you planning on having a hot dog, pizza, sub sandwich, or pb&j? Maybe now you will. 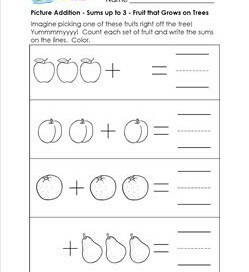 Add each set and write how many. Sums to 9. Ever been on a cruise? You could pretend! 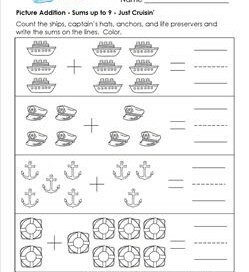 Our cruise-themed addition worksheet has images of a ship, a captain’s hat, an anchor, and a life ring. 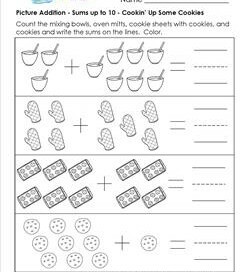 Have your kids Add them up! Sums to 9. Yikes! Where did all the mice come from? 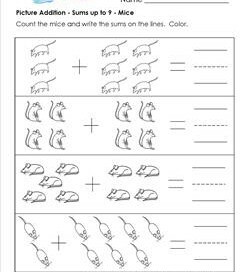 These scurrying, pensive, and resting mice make up this picture addition worksheet. Hopefully this is the only place you’ll ever see so many mice in one place. Go ahead, count and add. Sums to 10. Gosh! Who doesn’t like making some cookies? We’ve got all the steps right here (except licking the spoon). Mix the batter, use the oven mitt, bake the cookies, then eat! Yummy! Add the items in each step. Sums to 10. 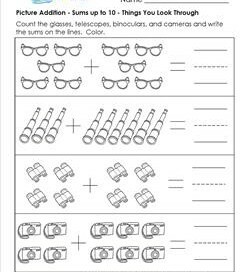 On this worksheets we’ve got some glasses, telescopes, binoculars, and cameras. Can you think of other things you look through? What could you see if you looked through each of these? Count and add all the items.